Anything wrapped in bacon is a sure winner. When I saw this recipe on The Pioneer Woman, however, my first thought was, "um... ew." But I kept coming back to it. "It just can't be that good. It's a cracker. And it's wrapped in bacon. How does that not just taste like a cracker wrapped in bacon?" But something magical happens in the oven. And it transforms the cracker into something entirely new. And the bacon isn't greasy awful; it's crisply chewy (squarely round? hardly soft? I can keep going, here). Anyway, my husband really liked them, and that's why I'm posting them. They're really yummy, and best of all, they can be served at room temperature so you can wrap 'em the night before and bake 'em up the morning of the party, or even bake 'em ahead, freeze and reheat before serving. 1. Lay crackers (as many as you want) face up on a cookie sheet. 2. Scoop about 1 teaspoon of grated Parmesan cheese onto each cracker. 3. Cut your package of bacon in half and carefully, so the cheese doesn’t fall off, wrap each cheese covered cracker in one half piece of bacon, completely covering the cracker. It should fit snugly around the cracker. 4. 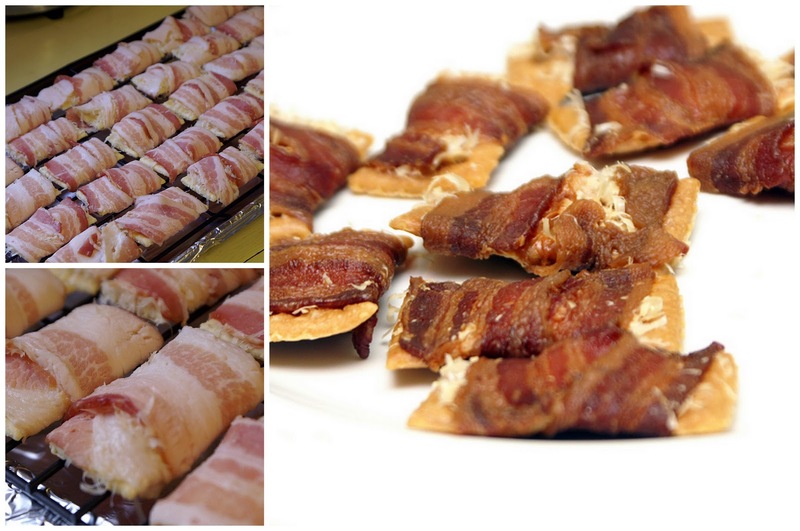 Place the bacon wrapped crackers onto a baking sheet that has a rack on it. 5. Place in a 250-degree oven for about 2 hours. I hope it turns out well for you! The first time I made 'em they were YUUUM, and then the second and third time they were kind of... bacony/crackery, :). I'm not sure. Try it out and see :).